2. Tap on the 'Sections' tab at the bottom of the screen and navigate to Utilities -> Select PkgBackup from the list of Packages. 3. 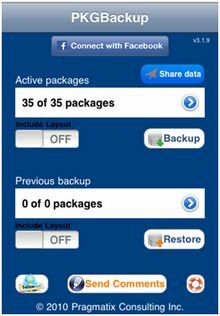 Purchase PkgBackup from the Cydia Store for $3.49. Once you have complete your payment information You will be able to install the app once the payment transaction is completed. 4. Tap on the 'Install' button on the top of the screen and Confirm button to begin your installation. 5. Once installation has completed successfully press the large Return to Cydia button. 6. return to your Springboard then launch the newly installed PkgBackup application. 7. 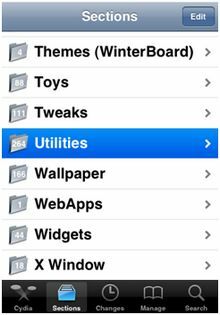 PkgBackup will begin by scanning all your installed packages/jailbreaks apps. Press the blue circular arrow button to view the list of active packages. 8. select an application from the list. From the package details window you can enable or disable backup of that particular package. 9. With PkGBackup, it is also possible to save your Springboard layout , From the main screen you can turn the Include Layouts witch to ON. Next, press the Backup button to begin backing up your application list. 10. Once Pkgbackup is finished it will prompt you to sync with iTunes. Connect your iPhone to your computer and launch iTunes Press the OK button to connect your iPhone to iTunes and perform the sync. Make sure that iTunes successfully completes a backup during the sync process. 11. your firmware has been restored and you have lost your Cydia applications the first step is to restore the backup we just made in iTunes. To do this, either Ctrl-Click or Right-Click on the iPhone in the list of devices in iTunes. Select Restore Backup from the popup menu that appears. 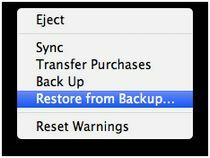 Chose the backup you would like to restore to from the list then click the Restore button. 12. Once the backup has been successfully restored to the iPhone you will need to follow Steps One through Eight again to install and launch PkgBackup. 13. Notice PkgBackup will detect how many packages you have installed and how many packages are available for installation from your previous backup. 14. Press the blue circular button to see the packages from your previous backup. You can select an individual package to see its details and set whether or not it will be included in a Restore. 15. Press theRestorebutton to begin installing all your missing applications. Once its done installing your applications PkgBackup will ask you to reboot. Press the Reboot button. 16. Once your iPhone restarts you will have all your applications back!